As families re-enter their neighborhoods, many are asking how to stay safe, where to go, and what the next steps are as they map out their road to recovery. 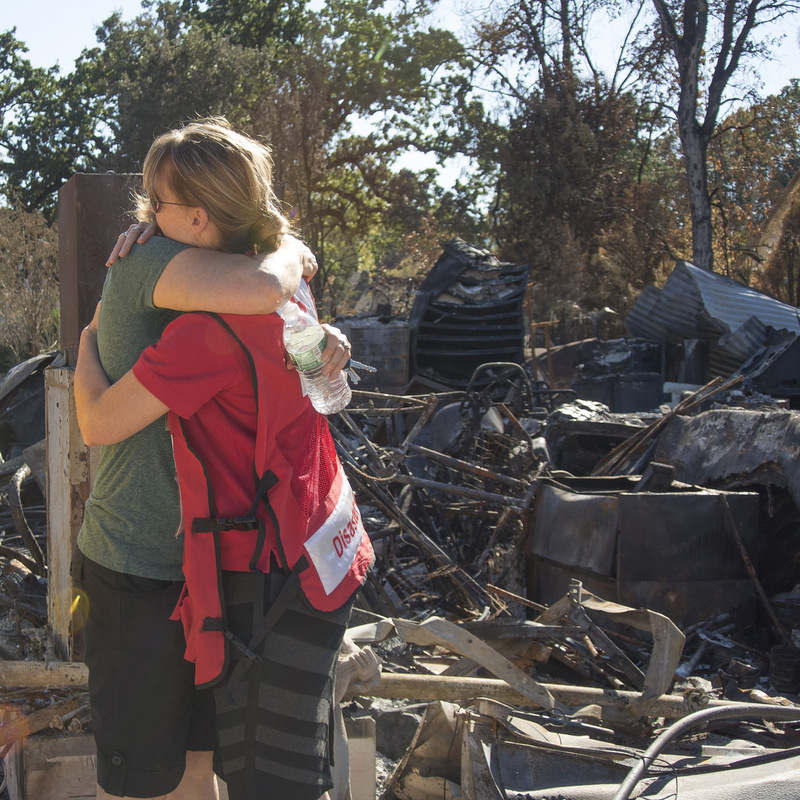 We have gathered some resources to help answer a few of the most commonly asked questions the Red Cross is receiving from those affected by the California Wildfires. The following information has been developed with guidance from CalFire, California Environmental Protection Agency, California Department of Public Health, Calaveras County, and Lake County, California. Please note that all Red Cross services are free. Q: How do I know when it’s safe to return to my property? A: Do not re-enter your property until fire officials say it’s safe to do so. Check the CalFire website for most recent updates. Keep your skin covered by wearing long pants, sleeves, gloves and masks while sifting through debris to keep ash and any toxic chemicals away. Use caution when entering burned areas as hazards may still exist, including hot spots which can flare up without warning. A: Consult your local drinking water provider or check with your county officials to ensure the water is safe to drink. Wash any home-grown fruit or vegetables from trees or gardens before eating. Q: Can I eat the food that was kept in my refrigerator? A: If you were evacuated and/or without power, dispose of any food left in your refrigerator. Make sure to sterilize the interior and exterior of your refrigerator and freezer thoroughly before storing food when electricity has been restored to avoid contamination. Q: Where do I dispose of garbage if there are no trash facilities in my area? A: Do NOT dispose of ash or fire debris in dumpsters or garbage bins, as it may contain hazardous waste. Cleaning products, paint, batteries and damaged fuel containers need to be disposed of properly to avoid risk. Shop vacuums and other non-HEPA filter vacuums are not recommended to clean up ash. HEPA filter vacuums could be used, if available. Calaveras County has a debris cleanup effort in place. Lake County is developing a debris plan; please continue to check http://www.co.lake.ca.us. Q: How do I protect myself when cleaning up ash? A: Wear a mask, gloves, long sleeved shirts and long pants to avoid ash contact with skin, as it may cause irritation. If you get ash on your skin, wash it off as soon as possible. Some wet ash can cause chemical burns. Do not use leaf blowers as they will cause ash to disperse in the air. Q: Is it safe to allow my kids and pets near ash? A: Keep children and pets away from ash and do not allow them to play near ash pits. Wash toys thoroughly before children play with them. Hidden embers and hot spots could burn your pets’ paws or hooves. Q: How do I stay healthy during the recovery and clean up process? A: Cleaning, sorting and sifting through debris can be strenuous and emotionally taxing. If you experience chest tightness or pain, shortness of breath, or dizziness, seek medical care immediately. Some ash may cause chemical burns when it becomes wet on the skin. Make sure to pay close attention to children and the health and emotional impacts your family may be feeling. Q: Where can I find additional resources on getting disaster recovery assistance? A: You can register with the Red Cross for immediate relief needs. To do so, please talk directly with a Red Cross caseworker at a local assistance center, chapter location or call 855-224-2490. Please note that signing in at a Red Cross shelter does not qualify as officially registering for disaster relief assistance. Those who registered with the American Red Cross for wildfire assistance need to also register separately with the Federal Emergency Management Agency (FEMA) at 800-621-3362. Registering with FEMA is required to be considered for federal assistance, even if you have registered with another disaster relief organization such as the American Red Cross, the state, local officials or churches. The Red Cross and FEMA are separate entities that treat client information as confidential.